The 2016 presidential election is finally behind us and the results are in. Despite losing the popular vote to Hilary Clinton by upwards of 1.7 million votes, Donald Trump will be the 45th president of the United States. Something that we are far less certain about is what kind of policies the President-elect will actually enact regarding immigration. Anti-Trump protesters take to the streets following the election in Minneapolis, MN. Photo courtesy of Flickr user Fibonacci Blue. This means that all retiring immigration court personnel, including immigration judges, would not be replaced. Currently, a shortage of immigration judges and a lack of resources have been the primary reasons for a miles-long backlog in immigration courts. If Trump sticks to his plan, we can expect this backlog to increase exponentially. Immigration court resources increased 74 percent between 2002 and 2016, and the backlog of immigration court cases ballooned during this same time frame from 166,000 cases in 2002 to 516,000 in 2016. Currently, people in immigration court proceedings have to wait nearly five years for their cases to be adjudicated in some states. From the perspective of the American Immigration Council, the impact of Trump’s stated federal hiring freeze on the functioning of the immigration system will be tremendous. If implemented, it could grind the system to a complete halt. The reason for this is not only the hiring freeze, but Trump’s promised ratcheting up of enforcement measures. A significant uptick in removal cases, coupled with the suspension of personnel hiring, would result in a paralyzed immigration court system. This would lead to systematic weakening of due process for immigrants attempting to navigate the system, as well as leaving hundreds of thousands of people in legal limbo for many years. In 2012, President Obama issued an executive action that created the Deferred Action for Childhood Arrivals (DACA). While not a pathway to citizenship, DACA creates a safe option for immigrants brought from their home countries as children to step out of the shadows of being undocumented. It offered exemption from deportation and work permits, a non-immigrant legal status that encourages recipients to participate in and contribute to American society. Under Trump’s pledge, however, it is almost certain that DACA will be repealed in January 2017. This means that the lives of more than 728,000 undocumented young immigrants (referred to as Dreamers) are in a fragile state – they will now become eligible for deportation, despite having spent most of their lives in the United States. Whether or not the federal government will use information about the Dreamers, who made their undocumented status known to the government in order to receive DACA benefits, to pursue enforcement of them is unknown. Trump has not indicated if he would seek to deport DACA recipients. So-called “Sanctuary Cities” are places where state and local police authorities refuse to proactively work with the federal government to find and hand over undocumented immigrants to Immigration & Customs Enforcement (ICE). Despite overwhelming evidence that Sanctuary Cities do not experience crime at a higher rate than their counterparts, and in fact that immigrant populations contribute to their local economies at higher rates than their American-born neighbors, Mr. Trump has pointed to these locales as havens for undocumented criminals. 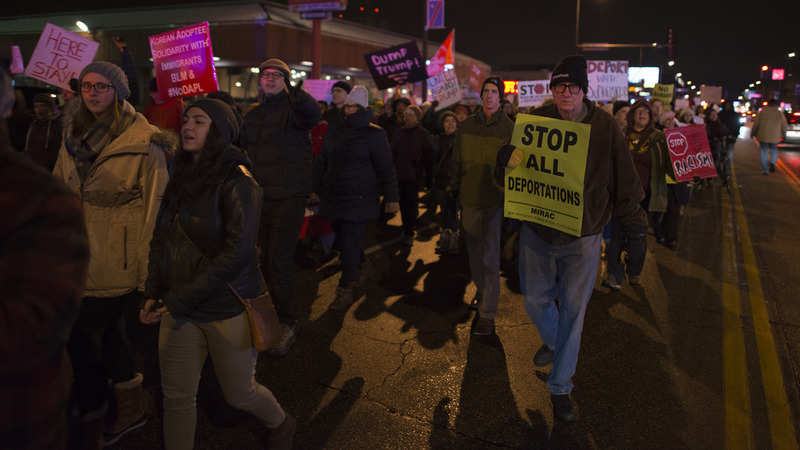 Local police chiefs and mayors in U.S. cities such as Los Angeles, Chicago, New York City, Denver, D.C., Philadelphia, Miami, San Francisco, Seattle, Austin, Detroit and Ann Arbor in Michigan, have rejected local enforcement of immigration laws, saying that is makes immigrants less likely to report crimes or help police conduct investigations. It is unclear which cities major U.S. cities will suffer from sanctuary city policies or what kind of funding will be rescinded. For instance, New York City receives nearly $10 billion in federal funding, which directly supports child services and public housing. One option for the Trump Administration is to bring back the controversial ICE Secure Communities Program. Born under President George W. Bush, Secure Communities allowed federal agents to be automatically notified when undocumented immigrants were fingerprinted and booked in local jails. Due to criticism from local and city officials and immigration activists, the Obama Administration backed away from the policy. According to NPR’s Immigration Correspondent John Burnett, this particular promise is an expansion of the definition of “criminal alien” by including immigrants in the U.S. illegally who are convicted of, say, drunk driving. President Trump will not need the approval of Congress to instruct ICE to round up every immigrant convicted of any crime and deport them all. But how much will this cost? Immigration officers have said that they have enough officers and detention beds to deport about 400,000 people per year. Unless Congress provides the necessary funds to hire thousands more ICE officers, hundreds more immigration judges, and construct many more detention facilities, it would take at least 5 years to deport 2 million people, not to mention a herculean amount of financial resources. The estimated 11 million undocumented people in the United States are here because they either overstayed their visas or entered illegally. During the election campaign, Trump promised to deport all 11 million of these individuals; however, he has since walked this promise back to prioritize the deportation of so-called criminals. He told CBS’ “60 Minutes” that he plans to “get the people that are criminal and have criminal records, gang members, drug dealers.” He estimated the number to be approximately 2 million, maybe 3 million. The accuracy of his declared numbers is called into question by the facts. According to the nonpartisan Migration Policy Institute, there are only about 820,000 undocumented immigrants with criminal records in the U.S.
Twenty-three countries, including Afghanistan, Cuba, Iran, and Zimbabwe, to name a few, will not accept criminal aliens sent back by the U.S. federal government. Trump could withhold visas for the citizens of these countries unless they agree to accept their deportees. From this promise, we can expect Trump’s administration to target refugee resettlement to the United States. Although not directly outlined in his 100 day plan of action, he has raised a lot of conversation and concern over a possible registry that would track individuals based on their religion. “Terror prone regions” per Mr. Trump’s definition refers to Syria, Iraq, Afghanistan, among other Middle Eastern countries. The concern that terrorists, disguised as refugees, could enter the United States in order to commit attacks has been discussed at length during Trump’s presidential campaign. The concern is legitimate, and frankly, is already being addressed, as refugee vetting is extremely strict. It is precisely because of the high risks involved that the security procedures in place for admitting refugees to America, which include clearance by the United Nations Refugee Agency (UNHCR), medical examinations, multiple interviews and rigorous background checks that take on average 18-24 months, are so thorough. A spokeswoman for Trump said that the President-elect plans on releasing his own vetting policies after he is sworn in. As with many of Trump’s promises, it is hard to predict what these new policies will look like. This past year, the United States accepted about 85,000 refugees. This number was determined by President Obama with consultation with Congress. Trump could reduce or eliminate the number or shift the focus away from Muslim refugees. The global policy implications of such a move, when the world is facing the worse refugee crisis since World War II, are worrisome. Despite crystal clear insistence from Mexico’s president that his country will not be financing a border wall, President-elect Trump has maintained this promise even in the wake of the election. Who will pay for this wall then, remains to be seen. We might see a rise in workplace raids and a push of undocumented immigrants out of their jobs. According to the LA Times, hardline immigration advisors on Trump’s transition team are also drafting plans to dramatically increase prosecutions of illegal entry. “Expedited Removal” is a process that bypasses immigration courts and allows immigration officers to expel foreigners immediately upon being apprehended at entry. However, the current process gives immigrants a chance to take a credible fear interview; that is, they are provided the opportunity to explain the conditions that expelled them from their countries of origin and flesh out why their fear to return is “credible.” If they cannot demonstrate a credible fear of persecution in their home country and do not pass per the opinion of the officer, then they can be returned home. Newly-appointed Attorney General Jeff Sessions, a known immigration hardliner, will have the authority to authorize a country-wide expansion of expedited removal upon Trump’s arrival in office. Mr. Trump’s promised plans for immigration are worrisome. On a broader scale, his policy proposals, if implemented, would be the kill shot for an already-ailing immigration court system. Fortunately, however, many of Mr. Trump’s promises on immigration are not within the realm of reality regarding practical enforcement. He will find implementation in the real world a more difficult endeavor than the cushy exercise of crafting empty campaign declarations. Regardless of what’s in store come January 2017, we as immigration professionals will continue to represent and advocate for immigrants and fight for the values we believe already make America great.